What It Is: If you’re stuck at your desk for most of this summer but are secretly California Dreamin’, then consider picking up a bottle of this amazing pseudo-sand. Crafted from 98% sand and 2% polymer, it actually has a gummy texture (like Silly Putty) that allows you to mold it into shapes that will actually hold indefinitely without drying out AND without sticking like crazy to your fingers / clothes / furniture, etc. Next time you’re having a rough day, just crack open some ‘Sand’ and start crafting an oasis for yourself. Who It’s For: Your sun-shy coworker, so they can get a taste of the beach. Your landlocked sibling, so they can remember what it’s like on the shores. Your knows-better-than-to-eat-it niece & nephew, for when the rain is keeping them from the water. How about an extra entry into last week’s Comfort Revolution giveaway? Just leave a comment below and tell me – would you splurge on this moldable sand? I think it would be a fun gift for my friend who loves the beach! Yes! It would make a cool gift! Not a chance – if I want to play with sand I head to the beach. I would try it. I love the beach and it relaxes me so I’d splurge to see if this had the same affect. It would be a bigger seller if the price was lower I think. The only way I’d buy this is during a momentary lapse of my sanity. I’d rather go to the beach to get sand with the added bonus of finding the odd shell or 2. Though I think it’s cool, I wouldn’t purchase it. I think it would make a great gift but I would not purchase it for myself. I have a friend that competes in sand sculpture competitions and this would be totally appropriate for him, but on a small scale of course. Would make a cute stocking stuffer. 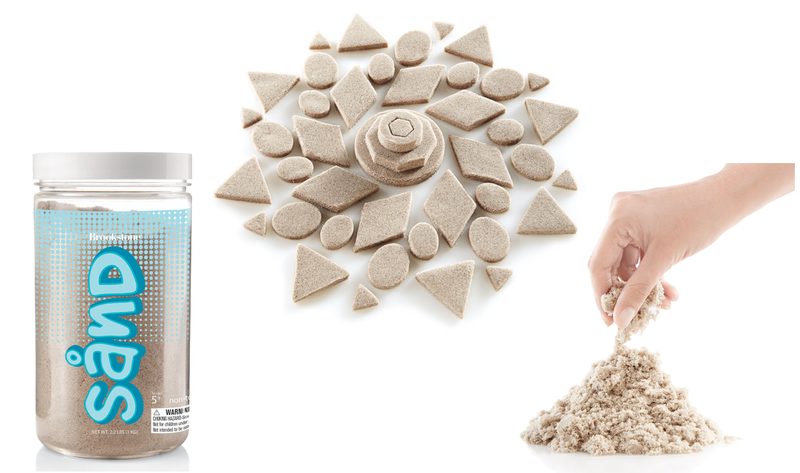 Comfort Revolution bonus entry: I might splurge on this moldable sand if I could think of someone to gift it to … secret Santa maybe? It’s not too expensive & would make a unique gift. I think it would be fun for a gift for someone who has everything. So yes I would. I think I’d get it, play with it a bit myself, and then re-gift it.